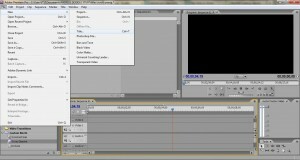 Abobe Premiere Pro fans: One of the most important components of any quality multimedia presentation is the titles and rolls. Titles and rolls enable the creator of the media to convey information, regardless of content. Whether it’s a simple credit roll or intricate tickers on the screen of your local TV station’s breaking news coverage, the technology is the same: character generation. Adobe has an exceptional title interface, enabling the content creator to only have two limits to possibly deal with: the scope of their imagination and the scope of their knowledge and proficiency of the Adobe package. Creating a title or roll is easy. Just go FILE—> NEW —> TITLE. Name your title or roll, and create. 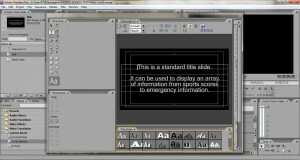 You have an array of fonts and characters available to you. You can key your content in on your own, or copy and paste from a document. Remember to spell check! Control room, anyone? Always remember to save, either with FILE —> SAVE, or Control+S. I recall my Capstone Project for my Masters in Science in Education Degree in late 2009 as a great example. APP was great in giving me the tools I needed to create my content. From a DVD screen shot, this is the title slide I created for my Masters Thesis, my contribution to the NSU IAP Capstone Project, The Creative Journey, 2009. Artwork created by and Copyright Antonia Martinez. Titles created in APP over artwork. Here’s what completed titles and rolls would look like. Remember, your only limitation is the scope of your imagination! 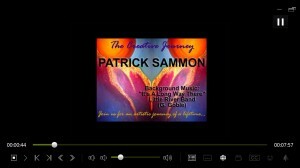 Title Slide from Patrick Sammon, Jr. on Vimeo. roll from Patrick Sammon, Jr. on Vimeo.